Fight to Become the Ultimate Arena Champion! Building on the success of EA’s #1 DS hit, Spore Creatures, Spore Hero Arena catapults you into a galaxy filled with fun and intense arena-based combat. Fight to Become the Ultimate Arena Champion! Building on the success of EA’s #1 DS hit, Spore Creatures, Spore Hero Arena catapults you into a galaxy filled with fun and intense arena-based combat. 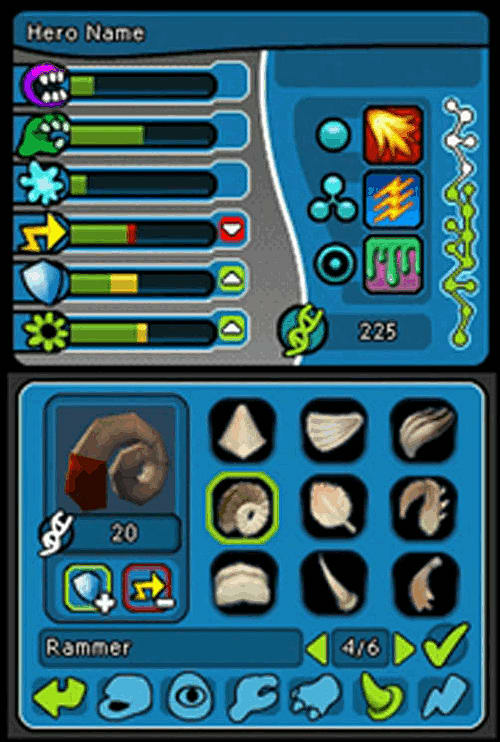 Built exclusively for the Nintendo DS, Spore Hero Arena lets you make your own Spore gladiators in the Spore Creature Creator, now for the first time in 3D! With more than 150 parts and unique Bio-Powers to evolve your fighter, you’ll embark on an epic journey to defeat corrupt arena champions all across the galaxy. The journey starts when a blue meteor collides with your spaceship. Forced to crash land on an alien world, you learn that all the galactic arena champions have fallen under the powers of dangerous red meteors. With the power of the blue meteors protecting you from the corrupted red meteors, only you can save the galaxy! In Spore Hero Arena, you’ll create your own unique Hero creature and guide it from planet to planet as you fight enemy creatures, complete quests, collect new parts and gain upgrades. In your journey to break the spell of the red meteors, you’ll seek out to defeat each local champion and unlock special abilities to further adapt your hero for battle. By combining special abilities, parts, and upgrades, you’ll create a fighting style of your own in hopes to take down the evil force and save the galaxy! 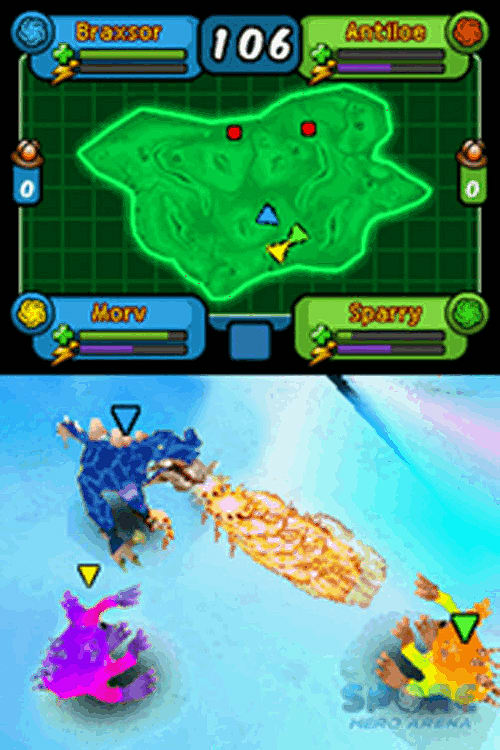 Developed with multiplayer capabilities in mind, Spore Hero Arena also allows players to battle with up to three friends locally or fight with a friend over Wi-Fi. 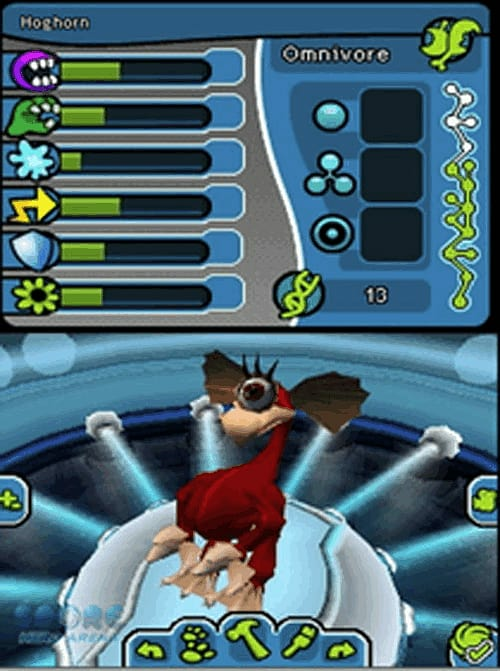 Create your Hero – DS Players can create their Hero with the award-winning Spore Creature Creator in full 3D for the first time on the Nintendo DS! One head or two? Buff legs or skinny and fast? The only limit is players’ imaginations! Intense Arena Battles—All-new game modes in galactic arenas engross players in unique arenas across the galaxy from the windy planet of Tyndale to the icy planet of Dentryte. Players will engage in epic creature skirmishes and battle royales to team battles and more! Game Enhancements- As players explore planets, complete quests, and defeat foes, they’ll gain impressive, unique parts and abilities. By using these parts, gamers will unlock special powers and new moves to enhance battle abilities. Sporepedia- Players can collect creatures, trade them with friends or track creatures met on the Sporepedia. Battle Friends- Competition is taken to the next level as players can challenge their friends to fight in their own ultimate battle. Fight with up to three friends locally or play with a friend over Wi-Fi.